The P-12 was one of the most successful American fighters produced between WW I and WW II. Used by both the Army and Navy (as the F4B), the P-12 was developed from prototypes built by the Boeing Airplane Company at their own expense. It was produced in a basic version and five additional series, -B through -F. The basic P-12 and the -B, -C and -D series had fabric-covered fuselages of bolted aluminum tubing. P-12E and -F fuselages were all-metal, semimonocoque (stressed skin) construction. All had wooden wings with fabric covering. 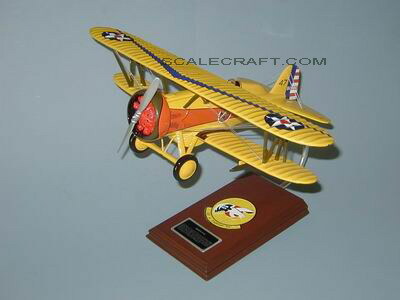 The Army Air Corps received its first P-12 in Feb. 1929 and the last P-12F in May 1932. The last of the biplane fighters flown by the Army; some remained in service until 1941. In all, 366 were produced for the Army. More P-12Es were built (110) than any other series. Mahogany Wood. Scale: 1/20. Wingspan 18 1/8 inches, Length 12 1/4 inches.